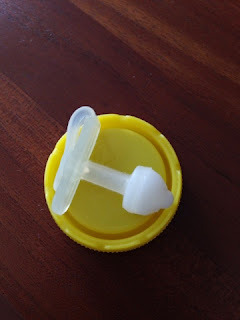 Last Friday, K had her replacement of her PEG button in the Children Surgical Centre. The entire thing was over in about a minute. I feel for K. They really yanked it out and popped in the new button. I guess it was the way to go. But it done was really fast and clean. I guess it would have hurt for a longer time if you took the time to slowly twist and pull it out. The area of the button was raw for few days, but expected. This is the Bard after it was taken out. It’s kind of our souvenir. It was last October when we first had the button done for K. We had the Bard button put in for K at that time. It was leaky after about 4 months. There was back flow, even 3-4 hours after last feeding. Since recommended time for change is about 6 months, we made an appointment to change the Bard out. This time, we opted for the AMT Mini ONE Non Balloon. The only thing about this AMT button is that it is slightly bulkier than the Bard. The Bard has a lower profile compared to the AMT when compared with both the continuous feeding tube inserted. If you don’t like the button/feeding tube combination to look like a small erm…button underneath the shirt, Bard would probably be the way to go. Let’s see how this model of AMT button goes.